I honestly did not think I would like Summer Dream but that and Love and Honor were the ones I liked. The other ones did not keep my attention. 1. Summer Love - my favorite from Summer Nights! 2. Summer Villa - my pick for best love story! 3. I would watch all of them, again and again!!!!!! 5. Summer Love, but I do wish I could see her shoes! I loved this, Net. Can't wait to do it again, after Fall Harvest! 5 Summer of Dreams - that musical note for the f in the word of is very clever. Hands down for me, Summer Villa. 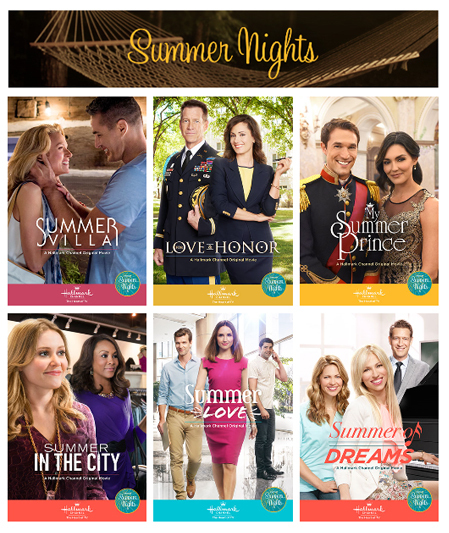 I wasn't overly taken with this block of Hallmark movies. Maybe, it was just me, but nothing special here. me neither. they were all boring. I'm with you. Nothing special came out of this block of movies. 1. My favorite was Summer Villa... the couple's chemistry was top notch and I just love Hilarie Burton, ever since One Tree Hill. I can't wait for Fall Harvest and Countdown to Christmas (which is my FAVORITE)!!! Honestly, I really didn't care for any of them...I'm betting I'll like the Fall ones better. I love this, Net! !....so much fun!! Can't wait for "Fall Harvest"!! My Summer Prince followed by Summer Villa. The rest were not very good. Summer Villa and Summer in the City were my faves. I didn't get to watch them all. The best movie poster is 'Summer Villa'. 4. If you watched them all, rank the "Summer Nights" movies from favorite to least favorite. I haven't watched them all yet. Net, I just wanted to let you know that official pages for the new Gourmet Detective and Aurora Teagarden movies have been posted on the Hallmark Movies & Mysteries website. Except for Love and Honor, they are all about the same, I couldn't really rank them. I got equally as far into them before deleting. They are all equally fine. 4. Summer Villa, Summer Love, Summer in the City, My Summer Prince, For Love and Honor, Summer of Dreams. 2. That would be a tie between several of the movies. 3. I would re-watch all of them. 4. I hate ranking when I didn't dislike any of the movies. Summer Villa would be first by a slight edge. Summer in the City would be at the end of the list, though I found the shop-girls to be funny. And the rest would basically be tied in the middle. 5. I like the poster from For Love and Honor. Summer Villa was my favorite. For Love and Honor was probably my least favorite (although I didn't dislike it). I'm truly not sure how I would rank the other 4 movies. Summer in the City had a romance that was realistically paced. It didn't feel like they were rushing anything, but instead taking the time to get to know each other. But I also thought that Hilarie Burton and Victor Webster were cute together. I like the My Summer Prince poster best, because I like the font used for the title! I liked Summer Love favorite followed by Summer Villa 3-Summer Prince 4- Love and Honor 5-Summer Dreams. Although I liked them all...Really was hard to put them in a place. All of them at least twice, to give each an honest chance. Will probably watch all but Summer in the City multiple times. For Love and Honor: Something classy about it and very sharp looking. Though I do agree with CJ's comment, the music note in place of the "f" in Summer of Dreams is very clever! 3. Which "Summer Nights" movies would you watch again? Not all of them were exciting or interesting, but I'd watch them all again on a rainy day. Summer Villa appealed to me greatly and I loved it. I don't plan to watch Love and Honor or Summer Prince - not my types. I'll watch the other three soon. Love and Honor has a nice poster. Net, what are your answers??? Great question, Amy G. I haven't had the chance to see the last two, yet, but I will let you know my favorite of the *Summer Nights* bunch when I do! So far, 'Summer Villa' would be my top pick! As for posters, I like them all, but 'Summer Love' has a theater movie look to it that I really like. Summer Love was hands down my favorite! The only thing I wish was for Rachael's character to have more interaction with Collin instead of Will. Theyre so cute together and the quirky style of the movie is winning. Hallmark should do more movies like this! Summer Villa was definitely cute too. The cooking contest part at the end was a bit cheesy for my liking but I love the overall atmosphere and setting. The soundtrack was awesome! I watched Summer Villla I thnk twice, so that's my top pick. Was disappointed in My Summer Prince--felt it was a rehashing of Royal Christmas and Crown for Chrsitmas, two of my favorite "royal" movies. The others did not in the least bit interest me, but I did catch the final one, Summer of Dreams and liked it very much. Hopefully Hallmark will use Debbie Gibson for another vehicle--Christmas? The Fall Harvest movies look like they have potential, however. Finally caught up on everything. Was watching the Olympics when a lot of those were on and then had a bit of a catch p to do! 1. My favorite was definitely Summer Villa, love both actors, and it was a fun story with great dynamics and chemistry. 2. As a love story, I think I liked Summer Love the most. 3. I already rewatched Summer Villa, Summer in the City and Summer Love. Would probably rewatch For Love and Honor too and some point. I was actually really disappointed with My Summer Prince. I normally love the Royal thing, but the story was not very interesting or well formulated, and it all felt pretty formulated and lacking any spark. I liked him though, so wouldn't mind seeing him again. Still ranked above Summer Dreams just for being a Royal movie. Summer Dreams was just boring. But enjoyed the other four a lot. 5. Summer Villa! Way to bring across the emotion and chemistry in one shot. I know I am late but just came across this even though I come here often. 1 Summer Love 2 Summer Villa 3 Summer of Dreams were my favorite. Really liked them all but loved these. 1. I only saw three movies in their entirety; "For Love and Honor", "My Summer Prince", and "Summer of Dreams". Out of those three, my favorite was "For Love and Honor". 2. "For Love and Honor"
3. "For Love and Honor"
I'm skipping question number four because, like I mentioned earlier, I only saw three movies in their entirety. 5. "Summer in the City" because it doesn't have that "typical Hallmark poster" mold where it just features the lead couple.